TEXAN, Gary Gatehouse retired (senior intelligence gather/operative) with over 30 years of service to his country, served in Vietnam. 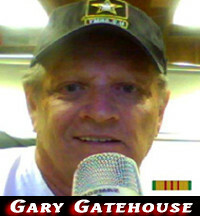 Gary gathers intelligence from all open sources does analysis and reports to his listeners his findings on those issues that impact “WE THE PEOPLE”. We who love liberty, we Christian people must stand together or forever lose our freedom of religion our freedom of expression, both in your country and mine evil has taken over and is now disguised as the truth and the leaders who preach it. The day is coming in Europe and America when we as God loving people will have to confirm or deny our belief in God the almighty and that day is coming to our doorsteps sooner than later! As Christian talk show host, one who believes in self determination and God given freedoms, I will continue to shine the light of truth on those that are working tirelessly to destroy everything good about out countries..